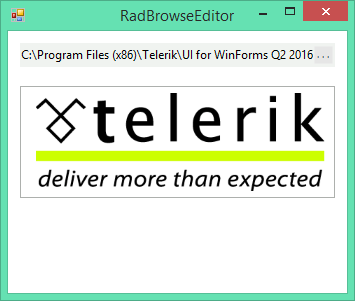 The following example demonstrates how to change the image of a RadButton using the RadBrowseEditor. 1. Drag a RadBrowseEditor and a RadButton on a form. 3. Select the RadBrowseEditor, click the Events tab of the Property Window, locate the ValueChanged event and double-click it in order to create an event handler. Replace the event handler with the following code. 4. Press F5 to run the application. Press the browse button and select an image. The image is then applied to the RadButton.